Look Linger Love readers are really cool. Like freaking awesome women doing super cool things. Way cooler than me. I’ve poured over everyone’s messages and think this survey was one of the best things I’ve done for the blog. I know a lot of you still haven’t taken it and I’m hoping you will. I’m leaving it up for the week. I’m going to do a post going over what I’ve learned, but for now let me just address the number one request. House pictures are coming, y’all. Just not quite yet. I’m still working on this place and tinkering with rooms and need things and yada yada. But I promise I’ll try to be better about showing little snippets when I can. Try to understand? Please? In the meantime it’s loud and clear that you like the personal posts. I’m glad to hear that because I enjoy sharing that stuff too (but not tmi). I will say that I treat my instagram account as an extension of this blog with more weight on the personal stuff (but not my kids up in your face every day). And I try really hard to not share the same things on my blog, pinterest, instagram, facebook, twitter and vine (geesh that’s a lot of stuff). I make a serious effort to try and switch it up so you don’t get bombarded with the same material in every outlet, because I know how annoying that is. So there’s that too. On to today’s post. Here’s a smattering of recent things. 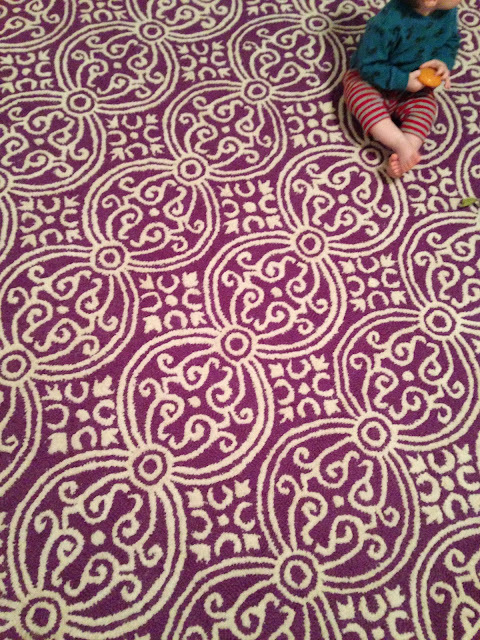 I just ordered this rug from Joss & Main and it came Saturday. 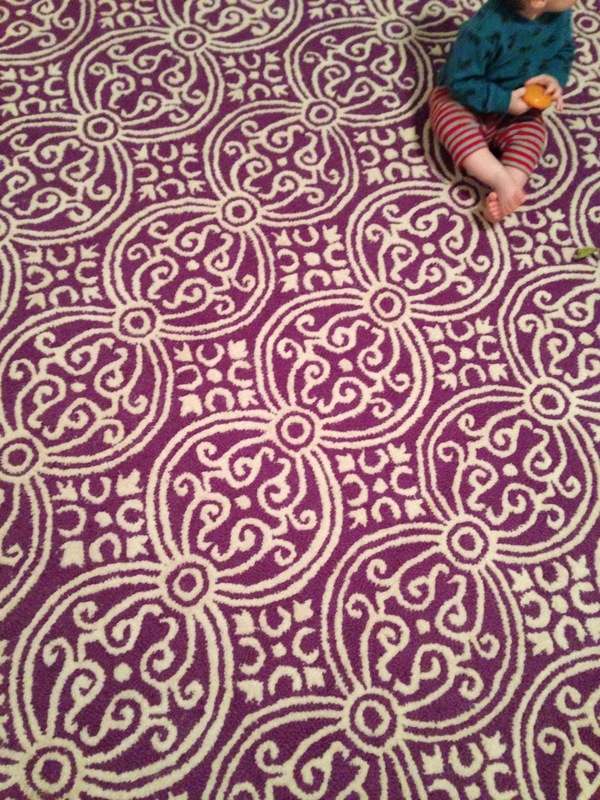 Really loving it- it’s super thick and soft and purple. Yes! I picked up this Amanda Uprichard top from Two Brunette’s here in Charleston. Please note how I am slightly giving you a peek at my powder room’s Atoll mirror and mudroom tile. I know, super lame peek, but I tried. Any hey, you gotta give me points for not getting the toilet in my selfie shot. Anyway, I am OBSESSED with Amanda Uprichard’s line. 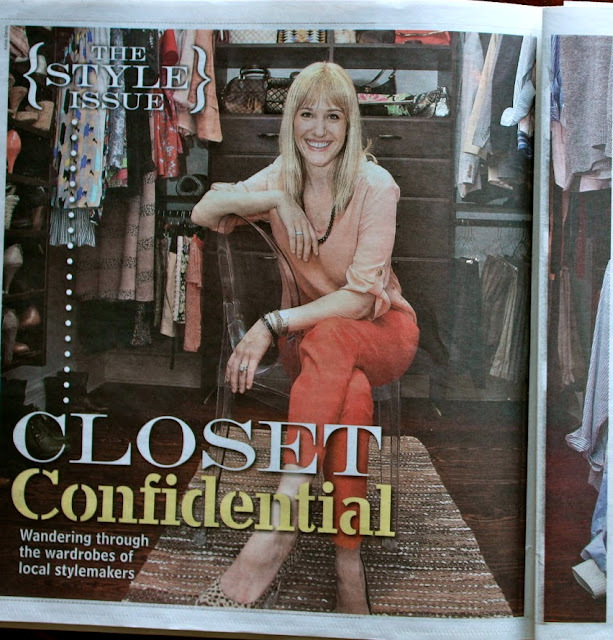 You may remember I wore her pretty tab sleeve blouse (with Gap skinny pants) for my Charleston City Paper closet feature. My friend Alesya, the designer behind the popular Alesya Bags, has this gorgeous one of kind red laptop bag up for grabs. She’s looking for a new tag idea and wants submissions. The winner will not only get this bag, but will also have their design brought to life by freaking Stitch Design. If you don’t know them, you should. They’re incredible, and are the masterminds behind my new site design that’s coming. Okay, I’m signing off so I can go read more survey responses. Super behind! Happy Tuesday. love love love the pictures of your house no matter how small my dear! Thank you for sharing Chassity! And yes, as you know, I did take the survey. I’m excited to hear more about what you learned. It’s so fun to see who is behind the clicks! yay! and LOVE that mirror – am convinced i’ll find a place for it in my house! looks great in person. I so noticed the mirror , tiles and lovely six panel door before reading your confession. Love the details , love !!! Do I need to do the survey? or do you know me well enough (wink wink). Still want the Atoll mirror, bad. and Love that shift and your new top super duper cute. I hope you don’t feel like you only can show your home when the rooms are finished and it all feels done. I much prefer when people share the journey and we get to see rooms in their befores and afters as well as along the way!